TE's onboard particle accelerator use different types of magnets (dipole, quadrapole, sextupole). All these types must be the most power efficient magnets possible; they must superconduct. Particle accelerators use many electromagnets to produce required magnetic fields. Typical synchrotron has many complex, powerful electromagnets, each magnet has perhaps a kilometer of electrical cable; each cable has hundreds of millimeter diameter wires. Ordinary electromagnets (e.g, "resistive" magnets) would require enormous power for such windings. Fortunately, superconducting wires require lots less power. Tradeoff: production of superconducting magnets is a sophisticated process with considerable effort to design, manufacture and assemble. A very simple electromagnet could be a wire wound nail (see diagram) and a connection to an electrical source (i.e., battery). A typical electromagnet is much more complex then a few turns of wire connected to a battery. It contains many windings of electrical conductors such as filaments, wires and cables. A superconducting electromagnet is even more complex and is described in detail below. Magnetic Fields focus and steer the particle beams. Different magnet configurations accomplish different functions. Dipole magnets steer the beams, a basic and necessary function. Orbits are by definition cyclic and near circular, and the beams must be "steered" for millions of orbits.Quadrupole magnets focus the beams radially. Groups of accelerated, charged particles tend to expand over time due to the initial random motion of the particles and the natural repulsion between like charges. The spread will increase until particles hit the wall of the vacuum chamber and are lost; thus, storage rings use quadrupoles to save particles and infrastructure. Problem: Laws of electromagnetism (Maxwell equations) show that it is impossible for a single quadrupole to simultaneously focus both vertically and horizontally. F and D quadrupoles alternate throughout the accelerator with carefully designed spaces between them. Tightly bunched particles naturally tend to spread. Fortunately, they will experience a horizontal force towards the center when they pass through the F magnet as well as a vertical force towards the center when they pass through the D magnets. The overall effect focuses the particle beam in both horizontal and vertical planes (see "strong-focusing"). This F-D lattice enables beam transport over long distances. Sextupole magnets synchronize separate particle collections by controlling longitudinal spread. As dipole and quadrupole magnets more strongly affect lower energy particles, any energy spread in the bunch will start to increase the bunch's length. Superconductivity occurs in certain materials generally at very low temperatures, characterized by zero electrical resistance. The resistance of a superconductor drops abruptly to zero when the material is cooled below its "critical temperature". An electric current flowing in a loop of superconducting wire can persist indefinitely with no power source. Superconductivity occurs in a wide variety of materials, including simple elements like tin, aluminium, and copper; various metallic alloys and some heavily-doped semiconductors. Superconductivity does not occur in noble metals like gold and silver, nor in pure samples of ferromagnetic metals . H. K. Onnes discovers superconductivity near absolute zero (4°K). (Nobel Prize 1913). IBM researchers, Georg Bednorz and Alex Mueller, discover certain ceramics superconduct at 35°K (-238°C). Paul Chu, University of Houston, achieves superconductivity in liquid nitrogen at 91°K (-182°C). High Temperature Superconduction (HTS) is born. Atom is basic component of matter; it has a nucleus with internal protons; it also has same number of electrons which orbit the nucleus. Smallest atoms have only one orbit with one or two electrons. However, many atoms are larger with many electrons arranged in multiple orbits (i.e. "shells"). Hydrogen has a single electron in one orbit, while uranium has 92 electrons across seven shells. Copper atom's outermost shell could fit at least seven more electrons. When considering electricity, the atom's most important shell is the outermost (valence) shell. Valence electrons can travel from atom to atom which results in electricity. During the conduction process, an electron leaves one host and quickly joins another. Materials with these kinds of atoms are conductors. That’s the case with our aluminum atom (and metals in general). One or more of its three free electrons might decide to wander off; likewise, the valence shell has room to accommodate visitors. which are almost 2,000 times larger. Some inherently stable materials (wood is an example) are insulators. Valence theory tells us insulators tend to not accommodate lone electrons because their outermost orbit is full; on the other hand, conductors can accommodate traveling electrons. positive charge of an available nucleus. Electron Hopping. In a copper wire, valence electrons migrate back and forth from one atom to the next. If you connect one end of the wire to a battery's anode (positive terminal), and the other end to the cathode (negative terminal), free electrons in your aluminum will move all in the same direction. This creates a circuit of streaming electrons, electricity, to fuel your radio or flashlight. FACTOID: In 1848, William Thomson (aka Lord Kelvin) invented the Kelvin Scale to measure the extremely cold temperatures. Kelvin developed the idea of absolute temperature, which places absolute zero at -273° C (-460° F). Kelvin scale places it at 0 Kelvin (0° K). Water freezes at 273° K (0° C). Electrical resistance comes from electrons bumping into non-receptive atoms (or other free electrons). This causes heat, and electric wires would be slightly warm to the touch if they weren’t insulated. While heat is sometimes an useful byproduct of electricity (in electric blankets or stoves); it often is not. FACT: Not all substances can superconduct. From the periodic table, 57 elements are known (as of May 2009) to superconduct. However, some elements only superconduct under high pressure or in modified forms, such as thin films or nanotubes. Father of Superconductivity In 1911, Dutch physicist, Heike Kamerlingh Onnes, discovered that a metal, mercury, lost all electrical resistance in extreme cold, and electrons flowed freely. To achieve super cold conditions, Dr. Onnes first liquified helium at 4° K.
Due to Cosmic Microwave Background Radiation from the Big Bang, most of deep space is a few degrees above absolute zero, about 3° K. However, scientists have achieved temperatures well within one degree above absolute zero in laboratories. TE's spaceship will have much better access to 3° K environment; thus, superconducting materials will be easier to cool then similiar materials on Earth's surface. How Does Superconducting Work? In 1957, three researchers (John Bardeen, Leon Cooper and Robert Schrieffer) hypothesized that superconducting electrons actually attract each other (this eventually led to their Nobel Prize in 1972). BACKGROUND: When metals are in their solid state, their atoms have a crystal lattice structure. Near absolute zero, these extremely cold metal atoms are barely moving. The Bardeen-Cooper-Schrieffer (BCS) Theory states that super cold metal's electrons pair upelectronic fluid cannot be resolved into individual electrons. Instead, it consists of bound pairs of electrons known as Cooper pairs. These zip through the static lattice with great efficiency to form a very fluid stream; thus, superconduction. Nitrogen is all around us. While oxygen gives us life, nitrogen makes up more than two-thirds of ambient air; the stuff we breathe into our lungs. High-Temperature Superconductivity Scientists have long pursued superconductivity at higher temperatures. If mercury superconducts at 4° K, other metals or alloys might superconduct at slightly warmer temperatures. The goal quickly became to create superconductivity at 77° K. While still frigid, that temperature could be achieved by liquid nitrogen, considerably cheaper and easier to work with than liquid helium. Nitrogen is certainly more readily available than Helium. Diamagnetism happends when a superconducting material excludes the magnetic force of another magnet and forces it to "float". It is formally known as the Meissner-Ochsenfeld Effect, after the two Germans, Walther Meissner and Robert Ochsenfeld, who discovered it in 1933. In 1986, a pair of IBM scientists came closer to this goal; they achieved superconductivity at about 30° K with a ceramic oxide. In 1987, Paul Chu achieved superconductivity with liquid nitrogen at 91° K, and a new field of research was born: high-temperature superconductivity. Today, scientists continue to push the envelope. As of 2006, the record of 138°K, achieved in 1994, was still standing. Scientists have actually achieved superconductivity at temperatures as warm as 164° K, but only under high pressure. --Superconductors become normal conductors above the temperature threshold for a given material. --In similar manner, superconductors also revert back to normal conductors above a certain magnetic threshold. Critical Magnetic Field can disrupt a material’s superconductivity. Recall the Meissner Effect: a superconductor can expel an outside magnetic force. The reverse is also true; a sufficiently high magnetic force can change a superconductor back to a normal conductor. The strength of the magnetic field required to break the material’s superconductivity is that material's critical field. •Type 1: “Soft”superconductors contain just one element (Examples: mercury or copper). •Type 2: “Hard” superconductors contain multiple elements (i.e. compounds and often alloys). 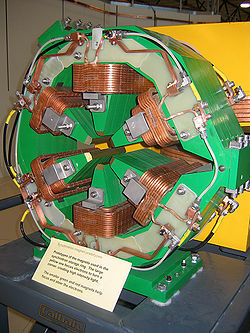 Also, high-temperature superconductors (HTS) are Type 2. However, Type 1 and Type 2 superconductors react differently to critical magnetic fields. Superconductors revert to normal conductivity in the presence of a critical magnetic field; however, Type 1 does it differently then Type 2. Type 1 superconductor operation is straight forward. Consider the element, mercury, which superconducts at 4.2° K. However, expose it to a magnetic field of .041 tesla or higher, and superconductivity stops; Cooper pairs break up, and mercury conductivity immediately reverts to normal. Type 2 superconductors have a magnetic critical field with a lower and upper thresholds. Consider niobium-tin (Nb3Sn), a compound which superconducts at 18° K; it is commonly used in the superconducting magnets of Magnetic Resonance Imaging (MRI) machines. Below a magnetic field of 0.01 tesla, Nb3Sn fully superconducts. Above 29 tesla, superconducting ceases entirely. Between these two threshold values (0.01 to 29 tesla), the material is in a "mixed state"; part of it conducts electricity normally, other part superconducts. In this mixed state, the superconducting material no longer fully excludes the outside magnetic field; as the field strength increases and approaches the upper critical field, the more the field penetrates the superconductor. The closer to the upper critical field you get, the less superconducting the material becomes. Type 2 superconductors generally can sustain superconductivity in the presence of much higher magnetic fields then Type 1. Thus, high performance magnets are Type 2 superconductors. Electromagnets use electron flow to generate magnetic fields. Traditional electromagnets (resistive magnets) use considerable electricity to generate their high magnetic fields. However, a superconducting magnet creates very high magnetic fields with much less energy. Resistive magnets stack metal Bitter plates into a coil. In contrast, superconducting magnets use hundreds of wires: wires are twisted into cables; cables are inserted into tubes; then, tubes are wound into a coil. Cost: Superconductor magnet costs about 1% of a similar capacity resistive magnet. This is true even when one factors in expensive cryogens (i.e., liquid helium and liquid nitrogen). Performance: Stable and more uniform magnetic fields. Less stable electricity (i.e., commercial sources) cause magnetic fields to fluctuate. Footprint: Superconducting magnets are also more compact and efficient. There is more current (i.e., amperage) per unit of space. Reliability: Superconducting magnets generally last longer. Resistive magnets endure considerable heat-induced wear and tear; not a problem for supercool superconductors. Complexity: They are more complicated than resistive magnets (a column of stacked metal discs); thus, more money/time to develop and manufacture. Critical Field: Superconducting materials are limited by a critical field; above this magnetic field strength, they can no longer superconduct. Thus, magnetic fields of the most powerful superconducting magnets are bested by the fields of most powerful resistive magnets. Low-temperature superconducting magnets use liquid helium (about 4°K) to keep cool. Materials could be niobium-tin (Nb3Sn) or niobium-titanium (NbTi). Niobium-titanium is cheaper and less fragile, but niobium-tin produces a higher magnetic field. Often, same superconducting magnet will use both materials. High-temperature superconductors (HTS) can superconduct at the higher temperature of liquid nitrogen (about 77°K). HTS materials include YBCO (yttrium barium copper oxide) and BSCCO (bismuth strontium calcium copper oxide). Today, most superconducting magnets are low temperature and use Niobium based alloys. TE notes: In space, how available are these elements (niobium, tin, titanium )? Can other more available elements (i.e., aluminum) be made to work adequately if not optimally?? CICC Magnets contain over 1,000 meters of cables, and each cable contains several hundred wires. Each wire is about as thick as a paper clip wire and contains many filaments; each filaments is thinner than a human hair (micrometer-thin). Many tiny filaments greatly increases the total surface area to more quickly disperse heat from the magnet and stabilize the magnetic field. In a multi-stage process, these filaments are embedded in copper to make a wire less than 1 mm in diameter. Thousands of filaments are twisted into wires, and hundreds of wires combine to create a thumb sized cable. Each kilometer of cable contains about 157 km of twisted wire. A copper matrix stabilizes the superconducting material. If a temperature spike interupts superconductor current flow, the copper will carry the current in resistive mode and divert the heat. This matrix protects from sudden overheating which could possible damage and/or destroy this valuable equipment. 1. Jacket cable inside a round stainless steel or other alloy tube. 2. Shape it into a rectangular cross-section (to compact even more). 3. Bombard the cable with sound waves to completely sanitize. 4. Wrap the cable with two layers of fiberglass tape for insulation and structure. 5. Wind cable onto a form, like thread on a spool. 6. Bake in a customized furnace at 700° C for about 10 days. In the final product, CICC wires are packed very tightly; however, liquid helium flows freely between them to ensure low-temperature environment required for superconductivity. A superconducting magnet contains over a kilometer of cable with hundreds of kms of twisted wire inside the cable. For one continuous conductor, wire segments must be welded together. The electrical current will encounter some resistance (and generate heat) at those weld joints; thus, such resistance must be minimized. Solid State Diffusion: Step 6 creates the superconducting niobium-tin alloy. Prior to heating, the wire contains two kinds of filaments: niobium and tin. At 700° C, the tin melts and diffuses into the niobium for an alloy which superconducts at near absolute zero. Epoxy Treatment. Finally, coil requires an epoxy shell. Inject expoxy into the coil; then, coil sets for several days in a warm impregnation chamber. This hardening process forms a shell around the coil much like the fiberglass epoxy composites in boats or Corvettes. Finally, the excess epoxy is painstakingly removed, and the magnet is ready to test. Wire-Wound Magnets: Uniform Fields WW magnets start out with the same materials as cable-in-conduit conducting (CICC) magnets: niobium-tin and niobium-titanium. Like CICC magnets, WW magnets also use wires wound into coils. WW magnet differs from CICC magnet in construction and use. For example, technicians install 100 layers of insulation around the WW magnet to maintain low temperature.To make a niobium-tin coil for a wire-wound magnet, use a bronze-processed conductor. 1. Embed tens of thousands of niobium filaments in bronze (an alloy mixture of tin and copper). 2. Wrap wire core in either niobium or tantalum. 3. Jacketed wire in copper (the niobium/tantalum layer prevents the copper from interacting with the tin inside). The finished wire's diameter typically measures about 2 mm. 4. Braid glass insulation around the wire to form a sleeve which electrically isolates each turn of conductor. 5. Wind wire tightly on a stainless steel spool. This takes thousands of turns with wire wound in several layers. 6. Cook the coil in a very hot furnace. In the bronze matrix, tin reacts with the niobium filaments to create the superconducting niobium-tin. 7. Inject epoxy into the winding pack; discard excess and coil is finished. Wire-Wound (WW) superconducting magnets cool from the outside in, from the surface of the coil. Cable-in-Conduit Cable (CICC) superconductors cool directly (and more efficiently), from the inside out. Steps are reaccomplished to produce several more coils of varying diameter and stacked one inside the next. For the final product, the whole WW magnet goes into a cryostat to keep the magnet cold enough to superconduct. This cryostat keeps the magnet cold from the outside. Cryostat uses vacuum, cryogenics (liquid helium and liquid nitrogen) with insulation to maintain a very low operating temperature. CICC magnets are quick and agile; they produce strong magnetic fields very soon after they power up. Quick magnetic fields produce a lot of heat, but CICC's powerful coolants control the heat. When magnetic fields change intensity, they create electrical currents in adjacent conductors; with current comes heat. However, CICC magnets can handle this heat because the superconducting wires stay immersed in supercold liquid helium (4°K). Since CICC magnets need electrical power, alternating current's (AC) changing directions can cause irregularities in the magnetic field. "Field Homogeneity" is a measure of magnetic change. In agile Cable-in-Conduit Cable (CICC) magnets, such change is measured in parts per thousand. In stable Wire-Wound (WW) magnets, field change is rare. It is measured in parts per million; sometimes, parts per billion. In constrast, WW magnets can't handle the heat because their coolant is far from the superconducting wires. Thus, wire-wound magnets ramp up very slowly, over several hours, days or even weeks; anything faster would create too much heat. However, WW magnets have an enormous advantage: they can maintain an uniform magnetic field with no outside power. After they eventually ramp up, they unplug from their power supply, but the superconducting current continues to run. For example, MagLab’s 900 MHz has been conducting electricity continuously, uplugged, since 2004! That smooth current makes a smooth, homogenous magnetic field that travels a precisely controlled path. consistent magnetic fields with no power requirements!!! Thus, the quick, agile CICC magnets have a distinct disadvantage; they need power!! A superconducting magnet uses coils of superconducting wire cooled to cryogenic temperatures during operation. no ohmic resistance in the windings. During operation, the magnet windings must stay below their critical temperature; the temperature at which the winding material changes from the normal resistive state and becomes a superconductor. Liquid helium is cools most superconductive windings, even those with critical temperatures far above its boiling point of 4.2° K. This is because the lower the temperature, the better superconductive windings work - the higher the currents and magnetic fields they can stand without returning to their non-superconductive state. The magnet and coolant are contained in a thermally insulated container (dewar) called a cryostat. To keep the helium from boiling away, the cryostat is usually constructed with an outer jacket containing (significantly cheaper) liquid nitrogen at 77° K.
One goal of the search for high temperature superconductors is to build magnets cooled only by liquid nitrogen. Above about 20° K, cooling can be achieved without boiling off cryogenic liquids. Niobium was first used commercially in the early 20th century. Brazil is the leading producer of niobium and ferroniobium, an alloy of niobium and iron. Niobium is used mostly in alloys, the largest part in special steel such as that used in gas pipelines. Although alloys contain only a maximum of 0.1%, that small percentage of niobium improves the strength of the steel. Niobium is used in various superconducting materials. These superconducting alloys, also containing titanium and tin, are widely used in the superconducting magnets. Superconducting magnets Niobium-superconducting alloys, Niobium-germanium (Nb3Ge), niobium-tin (Nb3Sn), as well as the niobium-titanium alloys are used as a type II superconductor wire for superconducting magnets. These are in particle accelerators. For example, the Large Hadron Collider uses 600 metric tons of superconducting strands, while the International Thermonuclear Experimental Reactor is estimated to use 600 metric tonnes of Nb3Sn strands and 250 metric tonnes of NbTi strands. Thought Experiment assumes on board accelerators will use both. Vast majority of these magnets will be WW for storage rings to maintain high speed particle beams for as long as needed; this could be several hours, days or sometimes even weeks. TE assumes a few CICC "extractor" magnets. These will accommodate requirements for ever changing magnetic fields. Exhaust requirements must constantly change (since fuel consumption ever decreases the ship's mass). A few extractor magnets (e.g., "pulsed magnets") in a storage ring will carefully output a "bunch" of particles out of the ring. These use a high voltage modulator to produce magnetic fields with very fast rise and fall times to ensure the field is only present for the chosen particle bunch.